I will include a few notions from my stash for the winner, too. :) And the giveaway is open to everyone--I'll ship internationally if needed. To win, please leave a comment telling me one thing you're planning or otherwise looking forward to this summer. Make sure you aren't a no-reply blogger; if you're not sure what that is then include your email address in your comment. If I can't contact you, you can't win! The giveaway will be open until May 25 at 5 p.m. Pacific time. Thanks for stopping by and don't miss all the wonderful giveaways over at Sew, Mama, Sew! One more thing--if you're new to my site, I invite you to look around a little bit; I've written several quilting and other sewing tutorials that you can find linked up in the menu bar... or just click here for the tutorial list. Have a great day! Oh how lovely! I am looking forward to spend as much time as I can in our wonderful garden! Very nice! Some of my favorites there. I plan on hand seing while laying in the sun. If the weather stays fine! Thanks! Cuuute, I love the colors you combined. I am looking forward to stone fruits this summer! I just had my first taste of apricots last weekend and they were sooo good. Looking forward to getting away for a week or so. I have a trip to the beach planned that I am counting down the days for! Looking forward to sand, water and relaxation! I'm looking forward to spending many days on the beach! Thanks for the giveaway! I just enjoy being outside during the summer, rather it is fishing with my husband or watching my daughter play in her little pool. Memories are made! Cute, cute, cute. We're making our annual trek to Yellowstone! Can't wait. Thanks for the chance. what a cute little quilt! Thanks for the chance to win it! 2. taking our 3 girls to the ocean for their 1st time! I am so looking forward to home-grown vegetables. What a super giveaway. Thank you. It's gonna be such a cute mini quilt! I love the jewel tone colors with the coal grey! Looks super fab, Vicki! I'm looking forward to free time to sew with my grandma who has moved back home from Houston! LOVE those colors! I bet your Supernova is amazing! I am looking forward to taking my kids to their favorite swimming spot and having lots of free time to sew and craft. No set plans yet, but I'm looking forward to going boating! Sewing, visiting Grands, and staying cool if I can are at the top of my list. Look forward to seeing the kids from Arizona. Wish you could come, too--miss you all!! I love the mini quilt. I am moving to virgina this summer, to be by my twin sister. this summer is going to rock! I'm looking forward to spending a LOT of time a the pool with my girls! Thanks for the giveaway, Vicki! Well, I'm just getting the yard cleaned up, so I can hardly wait until the hammock is up and I can snooze or read on a sunny afternoon! Love the fabrics you are using in the mugrug. Thanks for the giveaway. Looking forward to lots of swimming!! Finishing UFOs! There are quite a few. What's not to look forward to? Spending time at the lake, sewing with my mom, grilling outside and gardening. Oh, and garage sales. Fun love the colors. Every summer my Mother in law takes all four of my kids for a week and I get a week off. that is what I look forward to the most! I will be looking forward to camping with my family this summer! Thank you for a chance to win this! I'm looking forward to spending more time with my family and having more time to sew this summer! Wow. What a cool prize. This summer I am looking forward to going to Squam Art Workshops for the first time and picking produce from my new vegetable garden - I finally live somewhere with a yard to plant in! Hurrah! I'm looking forward to our family trip to DisneyWorld! So excited!! Unfortunately it's heading into winter for me but I plan to do lots of crafting! so cute, and I just love the mug rugs... for this summer I will be home taking care of a ill husband and I look forward to him recovering.. Looking forward to relaxing in the back yard and reading a book in the sun. Thanks for the chance to win. I'm looking forward to enjoying the sun and planting and caring for a garden. Thanks for the awesome giveaway! I'm looking forward to spending time on our newly renovated porch. The colors in the mug rug are beautiful. Love those jewel tones. GREAT color combo Vicki! We're headed to lake Almanour for a whole week of vacation in under 3 weeks and I...can't...wait!!!!! I'm looking forward to the warm weather and possibly some travel. I would love to win this! I'm looking forward to swimming with Miss Maze. We tried once and she screamed. Loud. I can't wait to dig into a big juicy watermelon with my family. :) Thanks for the chance to win! Hmmm, we're heading into winter now brrr, but I'm looking forward to summer fruit fresh from the garden already- yum! I'm looking forward to the arrival of a new granddaughter in August! Looking forward to a couple of road trips this summer. One to Oregon and one to Alberta to visit my sister and her family. It's almost winter here in Australia, but every summer I look forward to crafting while out on Picnics. Grandchildren moving to my city next month. Can't wait! thank you. I just bought my first flat and I'm looking forward to decorating it! I live in Barcelona, Spain. I am starting my next master's degree! I can't wait. What a gorgeous giveaway, thank you. I am looking forward to our annual trip strawberry picking with the children and then jam making. Love the triangles. I'm getting up the nerve to try my first quilt. This could be my daily inspiration! This summer, I'm working part time to spend time with my kids (and hopefully have more time to sew and blog)! I'm looking forward to stone fruit and sunflowers. I'm looking forward to going to Bermuda this summer - I've never been! i am looking forward to visiting with my college kids home for the summer! thank you! Having a baby! Can't wait! I'm looking forward to the Olympics this summer! I'm hoping there'll be a great atmosphere here in London. I will be getting out of the heat of New Orleans and staying with a friend in Boston who is a wonderful quilter. Will attempt to try my first quilt! I am most looking forward to attending my brother in laws wedding! I get to hold my God Son in his little khakis! I'm looking forward to swimming again. And gardening, reading, baking. And sewing. Taking naps and walks... and realxing amongst manic sewing! 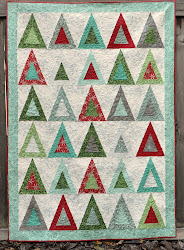 Super cute little quilt :) This summer I'm moving into a new house. I have lots of painting and fixing up to do. This summer I'm planning to start going to the farmer's market and expand my vegetable knowledge. I'm looking forward to an Alaskan cruise in July. i'm looking forward to my first girl's weekend away since my son was born. Love some HST's! I'm looking forward to the arrival of my third child this summer in late June. Thanks for the chance to win! Planning to do more sewing of course! Thanks. Beautiful mug rug. I am looking forward to the birth of my first great-nephew in July. Can't wait for school to be out! That is going to be a gorgeous mug rug! Love the mug rug! And I just checked out the quilt binding tutorial. I need all the help I can get, and all those pictures are perfect. I'm planning to do a lot of bike-riding with my daughter. We are going to Vancouver Island for a vacation this summer. It's time for our landlocked prairie kids to meet the ocean for the first time. Spending time with my grandson! I love the mug rugs and never have made on yet, would love to win and cherish! Thank you for such a thoughtful gift! Summer is just a dream for me... as it's heading into Winter here in Australia! But in Summer I love to get out & about and takes lots of photos, in Winter I love to curl up on the couch & crochet! Wow this is so cute, I love the colors and the contrast against the grey! I'm most looking forward to being able to hang out in the backyard and have cookouts. Excited for the first non-backyard camping with the kids, ages 3 & 1.
beautiful! i'm looking forward to spending time with my gorgoeus family! Love the HST quilt. I am looking forward to ripe tomatoes from my garden along with cucumbers. I love the colors with the grey. I am looking forward to my son's wedding and all of the planning leading up to it! I'm looking forward to spending time enjoying the waterfront of our fine city as the weather warms up. I'm looking forward to a couple of weddings this summer. A little road trip with each, to parts of the country I haven't seen yet. I am going to Yellowstone with my family! I'm planning on being really productive in my sewing room this summer. I also have 10 chickens to take care of and I'm taking a trip to Colorado in July to visit family. Thanks for the giveaway! I'll be heading to a wedding in Greece this summer. ...drool... I hope I win. I can't wait for hot dogs!!!! I'm moving house! Currently 11 days before my baby is due, I have my fingers crossed, but I'm thinking she'll make an early arrival, should be fun!?! I'm planning a trip to the beach this summer. I like the colors you've chosen for the mat you're giving away. Thanks for the opportunity to win your giveaway. I love the summer. There is so much more free time for me, and hopefully I can get some sewing and quilting done. The thing I was most looking forward to happened this weekend - I had tickets for England's first test match of the summer. We just bought our first house so I'm looking forward to making it ours by painting and decorating. I'm looking forward to swimming at the pool and having nice weather. I'm looking forward to my baby brother's wedding this summer! Thanks for the chance to win! I'm looking forward to going to Ireland in the summer! I'm looking forward to long summer days outside with my boys. looking forward to getting our building work done and having an awesome new space for summer! We're planning a vacation, which is always fun, and we just planted a garden, which will be fun (and a little work). 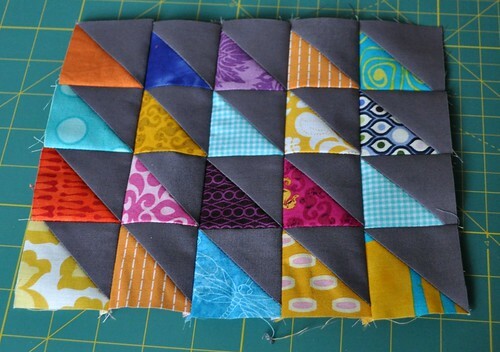 Beautiful piecing - I would love to win! Thanks! I like to spend time outside as the daylight hours increase. Of course, I always look forward to watermelon in the afternoon too. Oooo this reminds me of the bee block I made for my stash bee this month - lovely. I am looking forward to welcoming my little boy into the world in 1 month! I'm looking forward to much needed family time! I am just looking forward to the long hot days. Summer is my favorite season. I am planning on working on my Christmas quilts and gift bags so I am ready this year....for a change. A great giveaway! I am looking forward to taking it easy this summer. Sitting in the back, giggling with my kids, drinking lemonade. i plan to get some sun after such a cold winter. What a wonderful giveaway. I can't wait to spend some time at my cabin in the mountains this summer. Thanks for participating in the Giveaway Day. I cannot wait to get to South Haven Michigan this summer. snowcones! Thanks for the giveaway! Oooh! I love the colors you used in that quilt! so pretty! Love the gray in your mug rug! I am looking forward to spending time with my sister and parents this summer - every moment is precious! Thanks for the chance to win! I'm planning to stay at home and make a quilt for my sis and mum. We live in Virginia Beach, so there are lots of beach days ahead. We are also going to Niagara Falls for vacation. Camping in lassen national park! Going to a high school friend's wedding and it should be a great reunion. Staying at home this summer, sewing most of it. That is going to be a beautiful mug rug. Love it. One thing I'm looking forward to this summer is ripe tomatoes. It seems those in the store are going downhill more and more each year. Even the 'vine ripened' tomatoes don't have much of a taste. Sad. I love tomatoes so last year we bought some great planters that will actually water them when they need more so it's great. not having to get everyone out the door on time every morning. Looking forward to a week at the beach with my family! Very pretty. I plan on making some ocean pillowcases for my kids. We've got 4 weddings in the span of 3 weeks. Yikes! I love the mug rug! I'd put this at my sewing table! we are planning to go back to hometown in malaysia. This summer, I plan on spending a lot of time at the pool with my kids. Living in the desert it's just about the ONLY way to cool off! I love the mug rug!!! This summer I'm excited to visit family in north carolina, a wedding in wisconsin, and throw my best friend a baby shower! Our annual beach vacation! Thanks. I'm looking forward to my first flight ever: To Boston, MA. Also, I loooooove getting pre-patched items to use for my zippy bags. This is so cute. I love the colors. And, I love the Ruffle Crush quilt. Cute, cute, cute! Thanks for this lovely giveaway! so pretty! I'm looking forward to having six of my college friends visit me this summer, some of whom I haven't seen in almost 20 years! Can't wait for fresh local corn-on-the-cob and strawberries! Thanks for the giveaway! ave a trip planned for July, but I am nor sure how enjoyable it will be! Maybe if we make it to the snow we will be happier!